Cored island. This channel may have been used by both lava and water. One of the processes produced a crater-cored island and later, the downstream side was eroded away, leaving knobs and an inverted streamlined form. 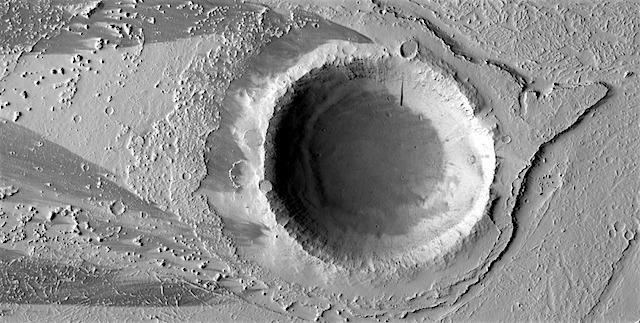 This entry was posted in Reports and tagged Beautiful Mars, craters, fluvial channels, High Resolution Imaging Science Experiment, HiRISE, lava flows, Mars Reconnaissance Orbiter, MRO, NASA, streamlined islands, University of Arizona. Bookmark the permalink.